If you find a pop-up which takes you to f1ash-p1ayer.us, leave that website straight away. F1ash-p1ayer.us pop-ups are deceptive alerts which recommend installing the Adobe Flash Player. 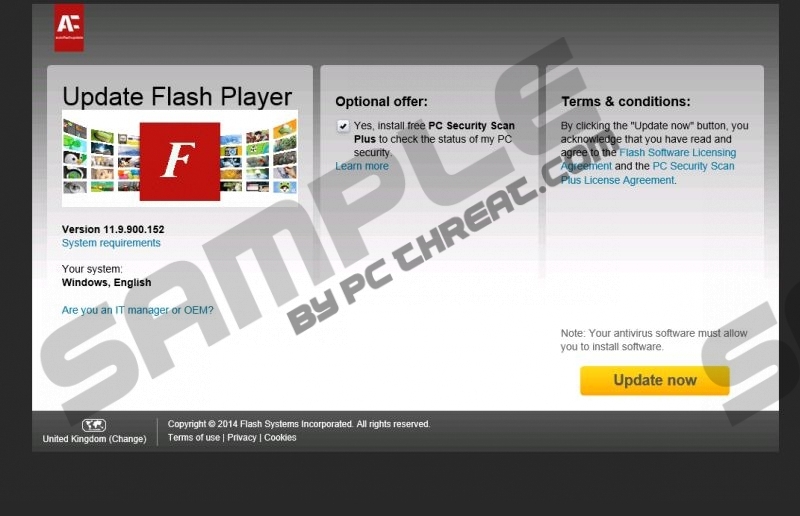 The website is almost identical to the official website of the application (get.abobe.com/flashplayer/); hence, you should be very careful when dealing with various pop-up warnings especially when they are displayed by adware programs. F1ash-p1ayer.us pop-ups are not the only advertisements that you can be provided with. You may find pop-ups inviting you to play online games, scan the computer, take part in a content, etc. All these advertisements are displayed by an adware program, and the sooner you remove it from your computer, the better. F1ash-p1ayer.us pop-ups can be displayed by multiple adware programs, which are likely to be installed as browser add-ons. Adware programs are very often bundled with other free programs; hence it is highly advisable to pay close attention to every page of the installation wizard in order not to skip information related to additional applications. The analysis of f1ash-p1ayer.us has shown that it provides computer users with an installer which contains various adware programs and so-called browser hijackers. When you access f1ash-p1ayer.us, you can be asked to change the settings of the browsers and install programs such as Contasurf, RRSavings and SearchProtect. The content of the installer may vary depending on your location and the time of installation; nevertheless, you should disregard every single pop-up encouraging you to make some changes on the computer. However, it is not enough to ignore annoying pop-ups. You should remove the adware program that is responsible for the display of all those questionable programs. The company that develops the adware program is not associated with the third party websites advertised, which means that you interact with all those advertisements at your own risk. The adware program may also monitor your online behavior. It may record your clicks, search terms, browsing history, browser language, your IP address, and some other non-personally identifiable details related to your browsing habits or Internet browsers. If you want to stop the adware program from displaying deceptive advertisements, remove that program right now. We recommend that you implement SpyHunter because this real-time security program can easily terminate various unreliable programs, including adware programs, browser hijackers, rogue anti-virus programs, and many other. In case you want to get rid of f1ash-p1ayer.us pop-ups manually, use our removal guide and then implement a reputable system scanner. It is highly advisable to scan the system after uninstalling the program. Click the button below to download a free scanner and invest in the program if necessary. Quick & tested solution for F1ash-p1ayer.us pop-up removal.